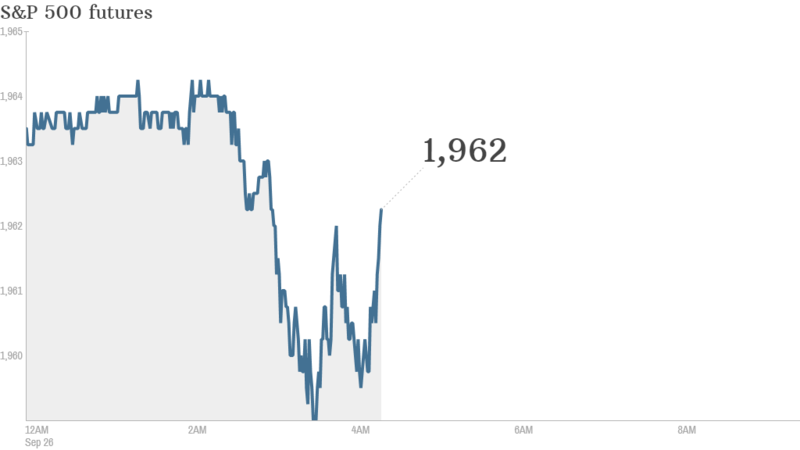 Markets are looking more settled Friday after a gut-wrenching slide this week. 1. Calmer waters? : U.S. stock futures were little changed, which may be a welcome sight for investors after stocks fell deep into the red the previous day. Apple (AAPL) and other tech stocks tumbled, driving the Nasdaq down nearly 2%. The S&P 500 fell by 1.6%, and the Dow Jones industrial average lost 264 points. "Following a strong summer rally, September is proving to be a more difficult month as some of the best performing trades are reversed," said Tom Beevers, CEO at StockViews. Gold prices were rising and the U.S. dollar was firming. These kinds of moves tend to occur when investors are nervous and looking for safe haven assets. The latest reading of the CNNMoney Fear & Greed index shows markets are feeling extremely fearful. 2. Just do it: Shares in Nike (NKE) were surging by about 7% premarket after the company reported a 70% jump in online sales in the past quarter. Shares in Micron Technology (MU) were also rising -- up by about 5% -- after the firm reported better than expected results. 3. Earnings and economics: BlackBerry (BBRY) and the Finish Line (FINL) will report earnings before the opening bell. The U.S. government will post its third estimate of second quarter GDP at 8:30 a.m. ET. The University of Michigan will publish its consumer sentiment index at 9:55 a.m.
4. International markets overview: Most European and Asian markets were in the red Friday, though the losses weren't dramatic. Australian markets took the biggest hit, with the ASX All Ordinaries index dropping by 1.2%.